PROVO, Utah (AP) Mark Few said his No. 1-ranked Gonzaga Bulldogs haven’t bought into the hype of their success all season long and have been able to focus on incremental progressions. He hopes things remain that way because the hype is continuing to trend upward after a 23rd consecutive victory. Nigel Williams-Goss scored 33 points and Gonzaga remains the lone undefeated team in the country after an 85-75 victory over BYU on Thursday night. The Bulldogs (23-0, 11-0 West Coast Conference) now have the longest winning streak in school history. They entered the night with the No. 12 scoring offense in the nation and looked like it. Gonzaga took a 42-26 lead after dominating the first half. The Bulldogs used a 20-4 stretch early to put BYU in a deep hole. T.J. Haws did the heavy lifting during the BYU rally, as the Cougars got within six at one point, and finished with 26 points. The Cougars (16-8, 7-4) had no answer early for the 7-foot-1, 300-pound Przemek Karnowski. Gonzaga ran the offense through the big man while building a 17-point lead and BYU was left to pick its poison. Karnowski would drop in a hook when left 1-on-1 against a defender, before the Cougars started sending help. Then Karnowski would kick it out and the Zags repeatedly found open shooters for 3-pointers. Gonzaga shot 51.9 percent from the field and knocked down 6 of 10 3-pointers in the first half while BYU hit 32.3 percent of its shots, including a 1-for-7 effort from behind the arc. Williams-Goss took over in the second half as BYU cut the lead to single digits. The junior point guard scored 11 straight points while blowing past defenders during a 13-3 run to push the lead back to 18 points. He had the answer every time BYU got close and was three points shy of his season high. ”He’s a ferocious competitor,” Few said. ”He’s confident. He’s mentally tough. He’ll be the first one to tell you he wasn’t’ playing good, especially in that first half. That just shows you how tough and clutch (he is). Gonzaga: All eyes were on the Bulldogs to see how they would respond to being ranked No. 1 for the second time in program history. Gonzaga stormed out the gate and looked every bit the part of the top team in the nation, especially on the road in a hostile environment against a conference rival. 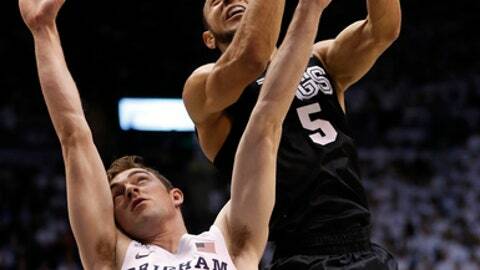 BYU: The Cougars were short-handed and overwhelmed. Defense has been an issue all season and it continued Thursday. BYU entered the game ranked No. 190 in the nation in scoring defense (72.7). Gonzaga should remain No. 1 barring what would be a significant upset against Santa Clara on Saturday. BYU guard Nick Emery was sick Wednesday and did not start. It was just the fifth game of his two-year career that he didn’t start. He entered averaging 13.9 points per game, but finished with two. ”William-Goss just kind of controlled that game,” BYU coach Dave Rose said. ”He had a pace to him and confidence to him where every time you make a run, he had an answer. He plays at a really comfortable pace for him. He’s hard to get sped up. Some of the other guys we could speed them a little bit and maybe get a turnover or bad pass or quick shot. Gonzaga: The Bulldogs host Santa Clara on Saturday. BYU: The Cougars host Portland on Saturday.